However, as though that weren't ambitious enough, this project also attempts to bring back old-school progressive metal, a genre with—let's face it—somewhat limited appeal. Whether you find Another Millennium? ultimately enjoyable or merely intriguing may depend on whether you liked Rush, Impelliterri, Metallica, or even Black Sabbath and Dio back in their day. As a lyricist, Gregory seems to strive to be as thick and inscrutable as possible. References to Nostradamus, the Bible, nihilism, feudalism, and goodness knows what else, accompanied by the standard heavy-metal Satanic cliches, swim together in a sort of primordial verbal stew. Vocalists John Levesque and Barbara Dietrich deliver charming couplets such as "So strange our day: how worth the stay?/Black is the cat: how dead your rat?" in an irritating, pretentious, pseudo-operatic fashion that serves only to distract from the new instrumental ground that Gregory and his ensemble are breaking. Hence I don't think this project succeeds quite as well as Gregory's new all-instrumental disc, 12 Jokes for Heavy Metal Mandolin. definitely notyour standard three-chord sleaze from a garage-dwelling consortium of drunks and GIT graduates. Almost every track features extremely complex rhythmic and harmonic interplay, lots of times signature and tempo changes, and amazingly full, dense, and tight ensemble playing. 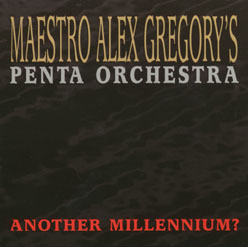 Gregory claims that his Pentasystem designs result in better intonation, and this recording provides the evidence. There are as many as seven Pentasystem instruments going at once here (recorded live with no overdubs or post-production pitch correction), and they're all perfectly in tune. When was the last time you heard seven ordinary guitars on pitch together? Gregory himself drenches this recording in lead Pentalin playing, proving convincingly that the instrument can do everything a lead guitar can, and more. From a low growl to the furthest reaches of the its 29-fret neck, the Pentalin screams, squeals, shrieks, moans, howls, bends, and shreds. It's not what you'd call predictable lead work, either. Gregory isn't afraid to take time to build his solos, instead of hitting you in the face with an unrelenting shower of 32nd notes right off the bat. "History" is a good example; the solo starts off meandering and works its way up to blistering. By way of contrast to Gregory's effects-laden playing, the great British guitarist/mandolinist Albert Lee shows up on a couple of songs ("In the Name of His Lords" and "Life Preys on Life"), playing undistorted "clean" Pentatar solos in his signature plectrum-plus-two-fingers picking style. His tracks have a twang that wouldn't be out of place on a John Hiatt disc—heck, even a Garth Brooks disc. Not exactly heavy metal material, but Gregory accommodates it by getting the rest of the Orchestra to back off a bit and then playing some soaring, violin-like Pentalin lines behind Lee. It's a beautiful moment. If you think you've heard everything mandolins are capable of, think again—and give this disc a listen, if you can find it.